From The New York Times' Health Blog "Well"
Children who misbehave at school are often punished by having to stay inside at recess. But new research shows that giving children recess actually helps solve behavioral problems in class. Researchers from the Albert Einstein College of Medicine reviewed data on about 11,000 third graders, collected in 2002 as part of the Early Childhood Longitudinal Study, financed by the United States Department of Education to determine how a wide range of family, school, community and individual factors affect a child’s school performance. 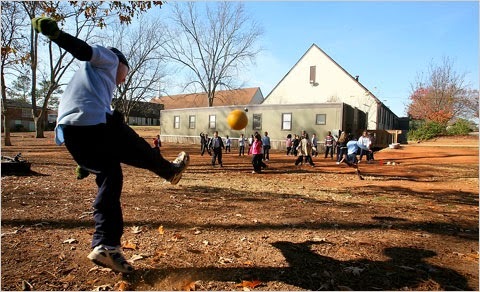 Decatur, Ga., playing kickball during recess. The study, published this week in the journal Pediatrics, found that about one in three of the children in the group received fewer than 15 minutes of daily recess or none at all. Compared with children who receive regular recess, the children who were cooped up during the school day were more likely to be from public schools in the Northeast or South. They also were more likely to be black, from low-income and less-educated families and live in large cities. When teachers were asked to rate children’s behavior, the kids who received at least 15 minutes of daily recess scored better than those who didn’t get recess. Dr. Romina M. Barros, a pediatrician and assistant professor at Albert Einstein, said the data were important because many new schools were being built without adequate outdoor space for students. She says it’s a “big mistake” for teachers to punish a child for bad behavior by denying recess. “We need to understand that kids need a break," Dr. Barros said. “Our brains can concentrate and pay attention for 45 to 60 minutes, and in kids it’s even less. For them to be able to acquire all the skills we want them to learn, they need a break to go out and release the energy and play and be social." It’s not clear from the data whether teachers also were affected by a lack of recess. It may be that teachers who were stuck in the classroom had less patience and gave children harsher scores for relatively benign behavior than teachers who received recess breaks themselves.